ST. PARIS – Graham Local Schools officials received double the good news on Friday from the Ohio Department of Education. The ODE and the Ohio STEM Learning Network has awarded Graham two designations as exemplary science, technology, engineering and mathematics (STEM) schools. Specifically, Graham Middle School and Graham Elementary were each honored with designations. Known at Graham by the STEAM acronym, the curriculum was enhanced at Graham when arts were added to STEM offerings. “Graham’s staff have worked hard to create a culture of science, technology, engineering, arts and math work,” Graham Superintendent Kirk Koennecke said in a prepared statement. He said Graham’s two designations were drawn from a pool of 22 applicants. “What makes a STEM school? 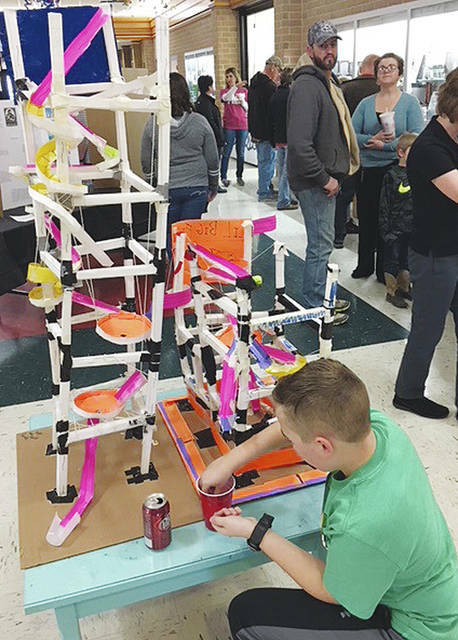 The answer lies in having a holistic approach to a rigorous culture, design learning and innovative practices that are integrated across classrooms and buildings,” said David Burns of Battelle, a private nonprofit applied science and technology development company headquartered in Columbus. Graham’s staff worked for the past year to define and refine practices to address their application, according to GMS Assistant Principal Nick Guidera, who led the application team. “We’re excited to recognize our faculty and staff for their hard work. That’s what this is all about,” he said. The ODE Committee remarked that leadership, faculty practices and student activities are all parts of the equation when they evaluate the programming impact on students and the local community. Marilyn Stinson, Amanda Croson, Emily Shreve, Chad Miller, Chad Lensman and others worked with Guidera and Graham Coordinators Joe Jude and Adam Mowery to prep for the state’s rigorous and lengthy application process. “We could not be successful without our strategic partners, both local and across Ohio, for helping us with key activities annually that demonstrate problem-based learning,” said Graham Coordinator Adam Mowery. Although the designations do not carry any financial grants or dollars, Koennecke said he is excited to have Graham recognized for the efforts made to provide today’s students a “future ready” education. The “future ready” slogan has been part of Graham’s mission for the past couple of years as the school has reshaped some of its approaches to modern education on a daily basis. The district has an earned income tax levy on the May 8 ballot.